"What would it be like to be at center court at Wimbledon?" It's a question I had asked myself ever since I was a nine year old playing mock Wimbledon finals against my brother, Mark, in the courtyard of our Mt. Albert, Auckland home. Still, no matter how many times you've asked yourself what it would be like, no matter how many times you've dreamed about it becoming a reality, no matter how many times you've mentally rehearsed it, nothing fully prepares you for the overwhelming emotional response you feel upon stepping out in front of the 15,000 people surrounding one of the most famous sporting arenas in the world. Having played on the respective center courts at the Australian (when it was at Kooyong), the French, and the US Opens (when it was at Forest Hills), I can say that, although they each have a unique atmosphere, none comes close to matching Wimbledon's unique ambience. 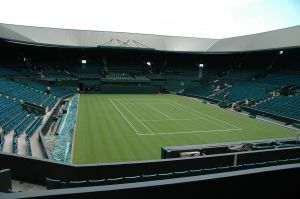 If ever there was a place where you find out about yourself, center court at Wimbledon is that place. From the time the playing schedule is released the previous day, to the time that you're informed in the locker room to be ready to play, to the short time you spend waiting in the special ante-room before walking out to play your match, everything that you do is geared towards what is always a huge occasion -- a match on center. With the obvious importance that is attached to the match, which is not only going to be seen by the 15,000 courtside spectators, but also by the millions of television viewers worldwide, your focus is well and truly sharpened by the time the immaculately dressed Wimbledon official lets you know that, "It's time to play, gentlemen." Our opponents were, ironically, five times Wimbledon winners and one of the all-time great doubles combinations -- John Newcombe and Tony Roche. I say ironically, as Newcombe and Roche had been two of the players whose identities Mark and I had assumed in our pretend backyard Wimbledon finals. Not only were they two of the greatest players in history, they were also two of the Wimbledon crowd's favorite players. With Newcombe and Roche being such sentimental favorites, the crowd acknowledged their return with a thunderous ovation, which, for me, only intensified the incredible adrenalin rush that every player feels on such a big occasion -- and there is no bigger occasion in tennis than walking on to Wimbledon's Center Court, the place where tennis players' dreams are turned into a reality. Are Tennis Champions Born? -- Or Made?